The Bottle Koozie is perfect for any bottled beverage, whether it be water, tea, or soda at a variety of different events or occasions. 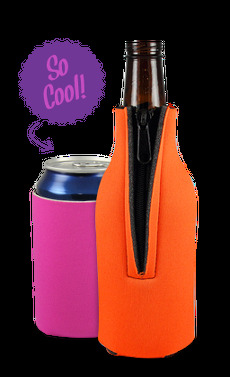 This quality bottle koozie is collapsible and equipped with a drawstring, allowing you to fold your bottle coolie up and carry it anywhere with ease. Your new bottle coolies are designed for most 12 oz. bottles sizes. These premium koozies are made with durable, lightweight 1/8" thick scuba material.